Objectives: The core aim of this paper is to improve our knowledge base on the innovation process comparing how public and private organisations can develop abilities to innovate in order to cope with the challenges created by the changing priorities of the political market, the intensification of global competition and the higher speed of the technological changes. The authors intend to identify and compare the creative/learning capabilities of the workplaces in the EU-27 countries. Research Design & Methods: In testing empirically the various types of jobs our analysis uses the data sets of the fourth (2005), fifth (2010) and sixth (2015) waves of the European Working Conditions Survey (EWCS). The EWCS is a crosssectional survey taken in every five years since 1990, organised by the European Foundation for the Improvement of Living and Working Conditions (Eurofound, Dublin). The recent editions of this survey cover more than 40,000 workers in the EU member states and in various other European countries (Eurofound, 2017). We used a cluster analysis in order to identify three clusters of jobs in Europe and their prevalence in different countries and country groups. Findings: The data from the European Working Condition Surveys (2005, 2010 and 2015) shows that in the public administration boosts creative workplaces in all countries. The ability of organisations to mobilise their internal resources into efficient and dynamic routines depends on intangible resources (e.g. creativity) and less on such traditional tangible factors such as physical or financial sources. Powering public sector innovation is inhibited by the following major factors: unfavourable institutional settings; weak innovation leadership; lack of systematic knowledge of the innovation process; and a shortage of the systematic data collection at both the EU and Member State levels. Implications & Recommendations: The increasing rate of creative jobs may speed up the implementation of the “High-Engagement Civil Services” to improve both efficiency and quality of work in the public sector. A more profound and evidence-based understanding of the innovation processes at the workplace level would allow us to exploit the full potential thereof in terms of positive impacts on both employment and job quality. Cedefop (European Centre for the Development of Vocational Training) (2012). Learning and Innovation in Enterprise. Research Paper, No. 27. Luxembourg: Publications Office of the European Union. European Commission (2013). Powering European Public Sector Innovation: Towards A New Architecture, Report of the Expert Group on Public Sector Innovation, Luxemburg: Publication Office of the European Union. European Working Condition Survey – 2005, 2010, 2015 database. Gallie, D. & Zhou, Y. (2013) Work Organization and Employee Involvement in Europe. Luxemburg: Publications Office of the European Union. Hall, P.A. & Soskice, D. (Eds.) (2001). Varieties of Capitalism. The Institutional Foundations of Comparative Advantage. Oxford: Oxford University Press. Hollanders, H. et al. (2013). European Public Sector Innovation Scoreboard 2013. A Pilot Exercise. Brussels: European Commission – DG for Entreprise and Industry. Illéssy, M. (2016). A gazdaság új fejlődési útjainak keresése: a szervezeti innováció és a szervezeti tanulás szerepének felértékelődése a gazdasági válság idején. Gödöllő: Szent István Egyetem – Vezetés és Gazdálkodástudományi Doktori Iskola. Kesting, P. & Ulhoi, J.P. (2010) Employee-driven innovation: extending the license to foster innovation. Management Decision, 48(1), 65–84. Lorenz, E. & Lundvall, B. A. (2011) Accounting for creativity in the European Union: A multi-level analysis of individual competence, labour market structure, and systems of education and training. Cambridge Journal of Economics, 35(2), 269–294. Makó, Cs. et al. (2018). Creative workers in Europe: Is it a reserve of the would be entrepreneurs? (A cross country comparison) In B. Dallago, E. Tortia (Eds. ), Entrepreneurship and Regional Economic Development: A Comparative Perspective on Entrepreneurship, Universities and Governments. New York: Routledge (in press). Makó, Cs. & Illéssy, M. (2016). Segmented capitalism in Hungary: Diverging or converging development paths? In V. Deteil, V.N. Kirov (Eds. 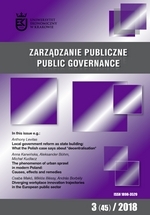 ), Labour and Social Transformation in Central and Eastern Europe, Europeanization and Beyond (pp. 77–97). London: Routledge. Makó, Cs. & Illéssy, M. (2015). Coexistence of the highquality human resources and poor organisational capabilities: Why do post-socialist countries lag behind the EU-15 in public sector innovation? In: A. Bhaltazar, B. Colob, H. Hansen, B. Kőnig, R. Müller-Török, A. Prosser (Eds. ), CEE e/Dem and e/Gov Days 2015 – Independence Day: Time for European Internet Integration? (pp. 283–296). Wien: Computer Society – Österreichische Computer Gesellschaft. OECD Governance Reviews – Engaging Public Employees for a High-Performing Civil Service (2016). Paris: OECD Publishing, www.oecd.org/about/publishing/corrigenda.htms. Parent-Thirion, A. et al. (2007). Fourth European Working Conditions Survey. Dublin: European Foundation for the Improvement of Living and Working Conditions. Saari, E., Lehtonen, M. & Toivonen, M. (2015). Making bottom-up and top-down processes meet in innovation. The Service Industries Journal, 35(6), 323–344. Szunyogh, Zs. (2010). Az innováció mérésének módszertani kérdései. Statisztikai Szemle, 88(5), 493–507. Totterdill, P. (2017). Interview with Bengt-Ake Lundvall: The learning economy, http://portal.ukwon.eu/The-Learning-Economy. Valeyre, A. et al. (2009). Munkaszervezeti modellek Európában és az emberierőforrás-gazdálkodás néhány jellemzője – Kísérlet a munkaszervezetek nemzetközi paradigmatérképének elkészítésére – I. Rész. Vezetéstudomány, 11(10), 2–15.